Engineered stone has only been around since the late 1960s, however, its popularity as a countertops material has skyrocketed in recent years, as its value and ease of maintenance benefits are more widely recognized amongst leading builders, interior decorators and successful home owners. There are pages and pages of discussion threads on some of the most popular home improvement online forums. Quartz as a surface material has many merits other than style. 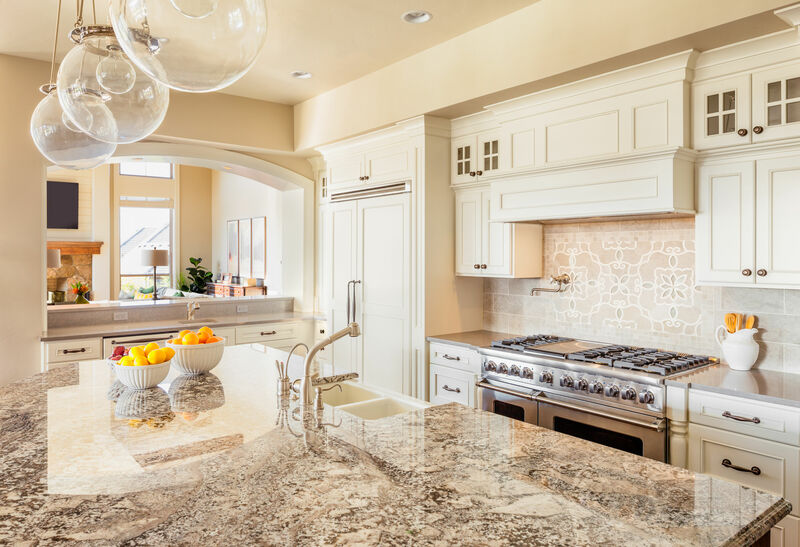 Here are a few of the reasons why demand for quartz is on the rise. With the development of engineered stone, otherwise referred to as a quartz filled polyester one has tremendous variety of patterns, colors and mixtures at a fraction of the expense of pure quartz materials. Quartz gravel is literally mixed with proprietary non-porous polyester resins and then extruded into a bun like a large piece of licorice. After cooling the bun is sliced into slabs for shipment to local fabricators to shape to fit your desired space and need. Today, an engineered surface can provide much of the beauty of natural stone without the shipping risk and expense, making it a popular choice in may upscale homes. With the process mastered…enter the artist. Today, through resin and quartz variations we are seeing slabs that can mirror fine Carrara marble and can be secured in greater variety than natural products giving designers greater freedom in color, texture and appearance. Ease of maintenance is one of the biggest draws for choosing quartz. Quartz is made of silicone dioxide, while marble is made of Calcium Carbonate. This chemical difference is huge, as acids will attack and etch calcium carbonate unlike silicone dioxide. Net result is counters that can withstand acid interactions from fruit, soda and other acid kitchen encounters. Simple maintenance is a major advantage for homeowners who also happen to be busy professionals. Quartz doesn’t need to be periodically sealed the way granite and other natural stones do. 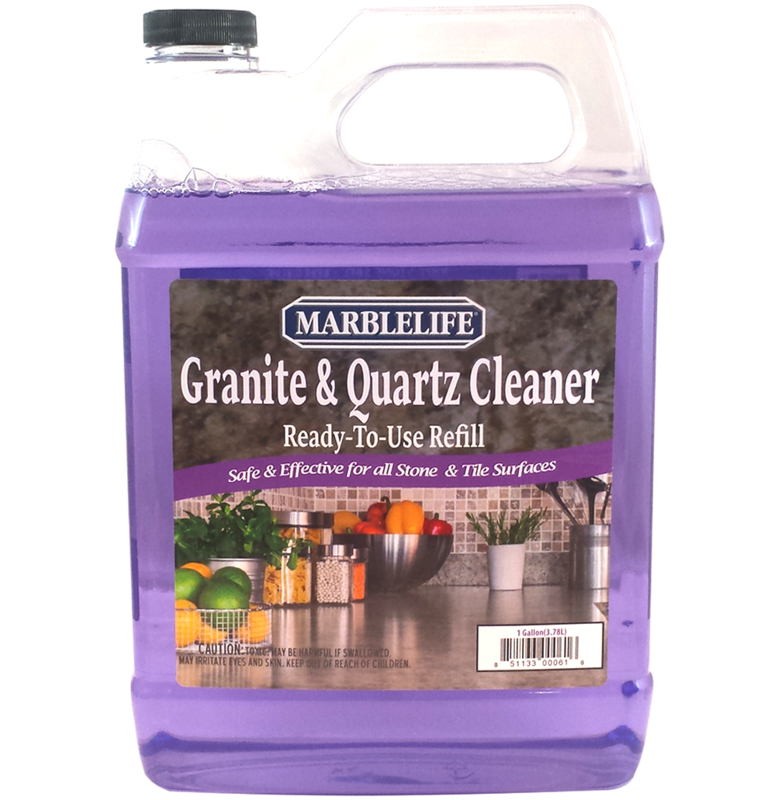 All that’s necessary is to use a quartz cleaner like MARBLELIFE® Granite & Quartz Cleaner. When quartz slabs are finished, the surface seal is permanent and does not need to be reapplied. This is because the very polyester resin used to bind the quartz together in non-porous, and therefore has no pores to seal or absorb spill stains. MARBLELIFE® provides a variety of cleaning, sealing, and restoration services as well as special proprietary blends of cleaners, sealers, and polishers. For any other questions regarding caring for quartz or any other stone call your local MARBLELIFE office and a knowledgeable stone craftsman will be happy to assist you. Call MARBLELIFE at (888) 524-3372 should you have any questions about your hard surface care and maintenance.